Didn't the news post yesterday say that the new hedt chips had these hardware fixes? Damn Intel is getting (more) confusing. Even more reason to preorder the fastest gaming CPU in the universe. Is Intel the new Apple? that kids are lining up to spend $1000 for 5% utilization they can't achieve. The news title needs fixing since just Meltdown is fixed, not Spectre. It's always been that way. Mainstream is the cutting edge, and HEDT a refined version of previous cutting edge. It's not going to fundamentally stop being "Skylake" until the next gen of HEDT. They're soldered aren't they, have better clocks as well? 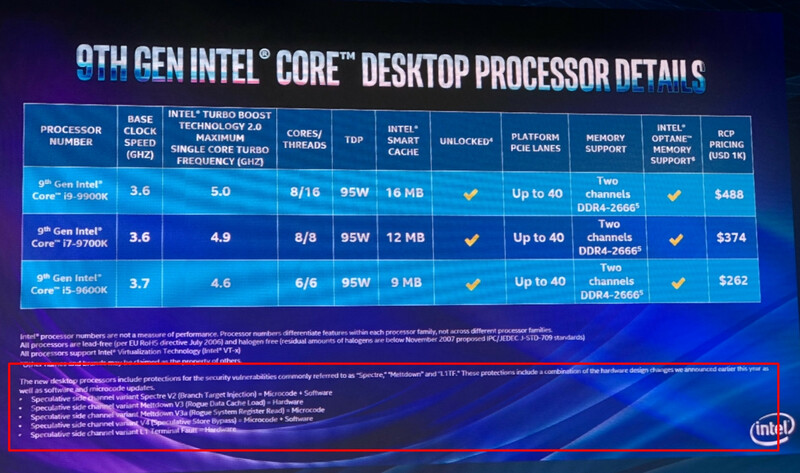 That's marginally better than the sham called Devil's Canyon aka 4790k which was supposedly shipping with better TIM IIRC. But now we are jumping not 1 but 2 generations for just STIM and higher clocks (like 100-200 Mhz). Fools and money are parted, I don't see the problem here honestly. There will always be a group that buys into hype, and they are also likely the most vocal about it. I must have missed it, but why are people so hyped over hardware fixes for Spectre/Meltdown? Well for one none has any idea how "smeltdown" affects real world applications long term, including but not limited to DC, cloud, HPC et al. The internal data they have will not be published IMO, though the vast majority of them have felt the brunt of it. The impact is non negligible to enormous, Reddit has some data but there's not much transparency about the impact from either the use nor the chip vendors. Well for one none has any idea how "smeltdown" affects real world applications long term, including but not limited to DC, cloud, HPC et al. The internal data they have will not be published IMO, though the vast majority of them have felt the brunt of it0. The impact is non negligible to enormous, Reddit has some data but there's not much transparency about the impact from either the use nor the chip vendors. That doesn't make sense. Whether you have the fixes in hardware or in firmware, your statements are still true. So the question remains: why prefer the hardware solution? The assumption is that hardware fixes will result in lower performance penalty, that's what most think/hope will happen. However there's no benchmarks to gauge the validity of the statement. I also believe personally that hardware fixes may not be the best solution, however Intel & their customers cannot take security for granted so regardless of the silicon version ~ they'll have to incorporate it via software or hardware. None of the big players can afford a security breach knowing what's out in the public domain, likewise Intel (or AMD for spectre) cannot hide in this day & age just because they have hardware to sell. Well, since the vulnerability is in fetched data, the only fix is not to fetch the data. The performance impact would be the same. A hardware fix is the best solution, however its only advantage over a firmware fix is that you know it's always there. That's why I don't fret over it being in hardware. As for security breaches and stuff, I'm not particularly worried. You can't reliably read data using these vulnerabilities, you can only glimpse at bits and pieces. Still need to be plugged, but for the time being I'm ok knowing there are fixes and they'll eventually be set in stone/silicon. That is indeed a good solution, however not the best one. For instance the original spectre & meltdown discoveries have lead to a dozen+ similar findings. Now when the hardware fix is introduced, it brings another variable to the equation, an unknown element & the results of which can only be observed & evaluated in due course of time. The hardware fix may resolve the vulnerabilities completely, or it may not, however your point of it being always there is more pertinent. The fix could also open up other avenues for "smeltdown" & this is why we can't IMO fully "fix" the current uarches. Well, if the fix is "stop fetching data eagerly", it can't possibly open up new attack vectors. Anyway... we all know this is a cat and mouse game that will not come to any conclusion during our lifetimes. 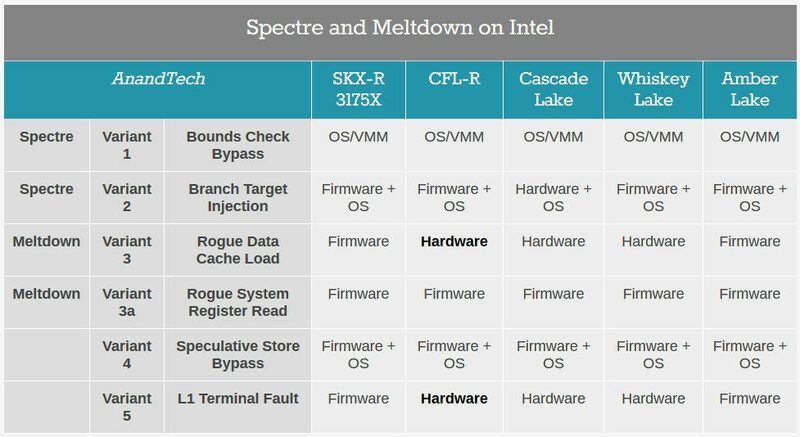 So, with the possible exception of 3a, Intel's new processors are now on par with AMD's when it comes to these Spectre/Meltdown issues? Mostly the same. Except these Skylake X Refresh parts are on the 14nm++ process instead of the older 14nm+ that the previous Skylake X chips are on. Hold on. Where are the benchmarks? I/O was hit the hardest.